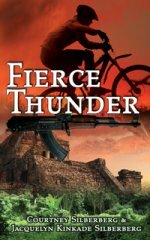 A mountain biking vacation in Mexico goes awry when vacationers and two guides stumble into a massacre between rebel forces and militia over drugs and antique gold coins. The race for survival is on, the group is forced to deal with greed and betrayal, while being hunted by determined criminals. Courtney and Jacquelyn held various executive positions in the film industry. Courtney - V.P. of Production for Gladden Entertainment (FABULOUS BAKER BOYS, WEEKEND AT BERNIE’S, MANNEQUIN II, MILLENNIUM, SHORT TIME). Jacquelyn - freelance DVD producer (Fox, Sony, Warner Brothers). Their company is Mesquite Entertainment®. FIERCE THUNDER is their first novel. What is 17 - 2 ? Really good book. Good read. Believed the characters. Good characters; develop throughout the book. Well written story; would make a vast moving action packed movie! I'd love to see this on film!!! I loved this book. As a mountain biker it was fun to imagine something like this happening on an adventure vacation and the desire to get away from a life not working out. An excellent read and I recommend it to anyone liking a quick moving adventure story. Would be an exciting movie. Awesome, visual read. Looking forward to reading other books by them. This book is going to make a great movie! Fun read. Would make a nice movie too. It is a wonderful book, full of actions with twists and turns that keeping you guessing. I look forward to their next book! Loved this book. Read it at the beach on vacation. Hooked me from the start. Looking forward to reading their next one.